Right off the bat let me confess that what I find irresistibly appealing about Kevin Miller's new documentary Hellbound? is that I was supposed to be in it. At the time Miller was planning his movie my blog posts on hell were hotter than Satan's sauna. (Those pieces have since been collected into Hell, NO! Extinguishing Christian Hellfire, a short e-book that via Nook is its regular price of $4.99, but which Amazon Kindle now has on sale for $2.99. It does not displease me that Hell NO! is listed on the resource page of the Hellbound? website.) Alas, by the time my scheduled shoot came around Miller thought that he already had enough footage for his movie, a shocking miscalculation that I can't help but believe doomed "Hellbound?" to be half as good as it might have been otherwise. Stupid Kevin Miller. What does he know about making documentaries, anyway? The bottom line on "Hellbound?" is that it's a smorgasbord of astute authors, interesting intellectuals, thoughtful theologians and rabid white trash talking about hell. (The movie's opening sequence features a clutch of Fred Phelps' Westboro Baptist Church members at the site of 9/11, vociferously screaming, "Thank God for September 11! Whoo-hoo!" and jauntily waving their trademark colorful signs proclaiming GOD'S WRATH = 9-11; THANK GOD FOR 9-11; FIRE FIGHTERS IN HELL; SOLDIERS DIE FOR FAG MARRIAGE and so on. Subsequently throughout "Hellbound?" we are subjected to watching Kevin try to reason with Shirley Lynn Phelps-Roper, the leader of the protesting Westboronians, which is like watching a dance instructor trying to teach a great white shark how to waltz. "Hellbound?" teaches us that generally speaking there are two views of hell: that it's real and that it's not. Joining the Westboronians in defending the reality of hell are the likes of bloggers Kevin DeYoung and Justin Taylor (who at the time of the movie's filming were making waves by roundly criticizing Rob Bell's then-just-released sensation "Love Wins"), and most notably the poster boy for the Christ Had Balls Like Boulders movement, Mark Driscoll, the only Christian in the world scarier than Shirley Lynn Phelps-Roper. Evangelicalism [by which he means reactionary, conservative evangelicalism] is to America what the Pharisees were in ancient Israel. These guys wreak vengeance on the people who bring the good news of a loving God who cares less about theology than the content of your character. Because in essence that message puts the gatekeepers out of a job. "Hellbound?" is a vitally important movie. More Christians than you can shake a trident at are convinced that to believe in a literal hell is more Christian than to not: that hell as a place of eternal torment is clearly biblical and something in which Christians have always believed. But that is not true. As "Hellbound?" 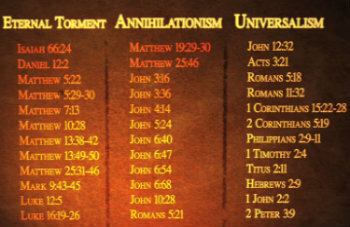 makes so perfectly clear, there is equal scriptural support for the radically differing models of hell known as Eternal Torment (good people: heaven; upon death bad people and all non-Christians: eternally barbecued), Annihilationism (the lucky make it into heaven; everyone else is instantly vaporized into nothingness -- but at least aren't eternally tormented) and Universalism (eventually through Christ everyone is redeemed and ushered through the Pearly Gates). At different times in history each of these theories of hell has enjoyed prominence; it's just that the one off which it's possible to make the most money, since it can be used to instill deathly fear, has now become so dominant that the other two are widely considered to be, of all things, less Christian. But that's absurd. It's like saying that because today is Monday Friday and Saturday don't exist. But Friday and Saturday do exist. They always have. And it's a certainty that they will come around again. If you are a Christian harboring the idea that a literal hell is incompatible with an all-loving and all-powerful God, and would like ironclad evidence and testimony from a wide variety of sources and experts in support of that idea, then you must see "Hellbound?" You will come away from the movie knowing two things: that your instincts about hell are not just morally but biblically right, and that the day is dawning when more Christians than not will agree with you. 'Hellbound?' opens this weekend in Pasadena, Orange County, San Diego and Grand Rapids. Visit hellboundthemovie.com for details on theaters, etc. The film's director and writer Kevin Miller will be doing a Q&A in Pasadena on Sept. 28, Orange County on Sept. 29, and San Diego Sept. 30. I have assured Miller that at his San Diego appearance I will keep my heckling to something reasonably near the minimum.